“Founded in 1984 by Steven Wasson and Corinne Soum, the last assistants of the father of Modern Mime  Etienne Decroux, the Theatre de l´Ange Fou tours extensively throughout the world. 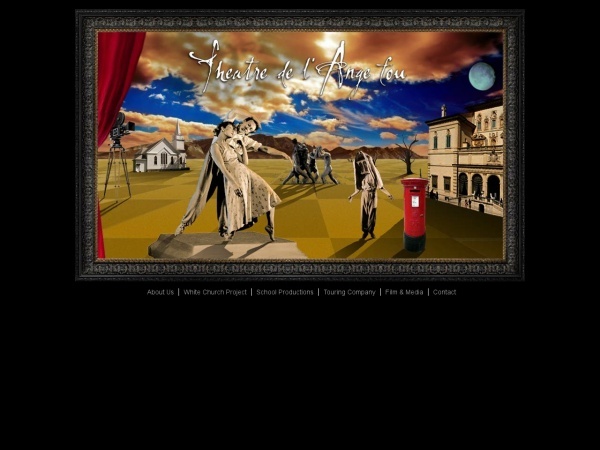 In the UK, L´Ange Fou has built a multi-national, multi-lingual mime theatre ensemble with which it has created over 20 original plays, adaptations and devised pieces ranging from solos and duets to works with the full ensemble of 17 mime actors. At its rehearsal studio at the Belgravia Workshops in north London, the company undertakes a new project each year exploring the infinite theatrical possibilities of dramatic corporeal mime. The Theatre de l´Ange Fou, has toured throughout Europe, Russia, the United States, Canada, Brazil, Mexico and the Middle East. The Theatre de l´Ange Fou has created over 20 original plays, devised pieces, as well as adaptations, ranging from duets to large ensemble works: The Little Dictator- parts I & II, Beyond the Garden, Crusade, Entangled Lives, The Government Inspector and their latest, The Orpheus Complex… revealing different aspects of the spiritual and human quest, portraying the frailty and complexity of relationships between individuals longing for love. Impressions of the mind, the absurdity of life and the resulting questions are a constant source of inspiration for both the directors and the actors. Using Corporeal Mime as the base of their creative work, the dramaturgical construction of their plays takes the form of a voyage where the characters traverse varied landscapes and lifetimes, some real, some imaginary. The world of the Theatre de l´Ange Fou, this visionary world of contrasting light and darkness, of metamorphosis, is populated by a family of invented archetypes in unkown yet familiar settings. Throughout their various productions, the Theatre de l´Ange Fou explores the infinite possibilities of the interaction between the corporeal score and the spoken text, music and film. Alongside this personal artistic development, Steven Wasson and Corinne Soum, in 1992, took up the challenge of re-introducing to the public the Repertoire of Etienne Decroux with their reconstruction, and performances by the Theatre de l´Ange Fou, of most of his major pieces (including La Meditation, Les Arbres, L´Usine…) in The Man Who Preferred to Stand, and more recently, Passage of Man on Earth and Resonance.